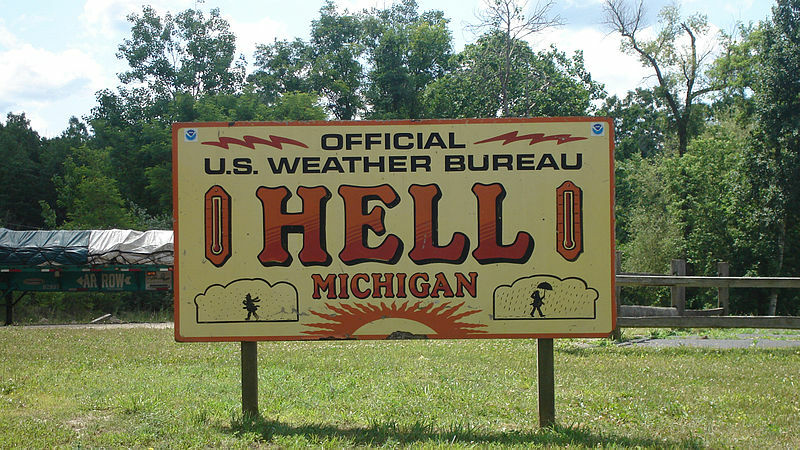 In this weather report, it looks like it is a cold day in Hell. 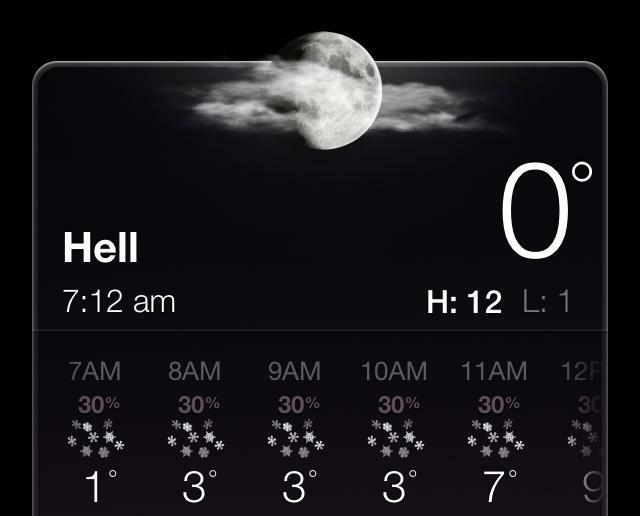 I’ll believe in when Hell freezes over (O.K., I know, enough with the puns). Hell grew up around a sawmill, gristmill, distillery and tavern. All four were operated by George Reeves. Reeves moved to the area in the 1830s from the Catskill Mountains in New York. He purchased a sawmill on what is now known as Hell Creek in 1841. In addition to the sawmill, Reeves purchased 1,000 acres (400 ha) of land surrounding the mill. Reeves then built a gristmill on Hell Creek which was powered by water that was impounded by a small dam across the creek. Farmers in the area were quite successful in growing wheat and had an abundance of grain. Reeves opened a distillery to process the excess grain into whiskey. Reeves also opened a general store/tavern on his property. The tavern and distillery soon became a thriving business for Reeves. He built a ballroom on the second floor of the establishment and a sulky racetrack around his millpond. Additionally Reeves sold his alcohol to nearby roadhouses and stores for as little as ten cents a gallon. His operation came under the scrutiny of the U.S. government in the years after the American Civil War. When tax collectors came to Hell to assess his operation Reeves and his customers conspired to hide the whiskey by filling barrels and sinking them to the bottom of the millpond. When the government agents left the area the barrels were hauled to the surface with ropes. As Reeves aged he slowed down his business ventures, closing the distillery and witnessing the burning of the gristmill. He died in 1877. Reeves’ family sold the land to a group of investors from Detroit in 1924. The investors increased the size of the millpond by raising the level of the dam creating what is now Hiland Lake. The area soon became a summer resort area attracting visitors for swimming and fishing. Henry Ford considered building some manufacturing facilities in the area but decided against it. There are two theories for the origin of Hell’s name. The first is that a pair of German travelers stepped out of a stagecoach one sunny afternoon in the 1830s, and one said to the other, “So schön hell!” ( translated as, “So beautifully bright!”) Their comments were overheard by some locals and the name stuck. Soon after Michigan gained statehood, George Reeves was asked what he thought the town he helped settle should be called and replied, “I don’t care, you can name it Hell for all I care.” The name became official on October 13, 1841. The second theory is tied to the “hell-like” conditions encountered by early explorers including mosquitos, thick forest cover and extensive wetlands. If you are ever in the Detroit area, stop on by. I’ll see you in Hell.